Tune in starting this Saturday, November 21, for a 30-hour broadcast of Coleman Hawkins' music in celebration of his 111th birthday anniversary! In addition to a full 24-hour preemption on his birthdate, November 21, we are extending the broadcast through 6am on Sunday, the 22nd, thereby preempting Saturday Night at the Opera and dedicating the normally scheduled Jazz 'Til Dawn program to the music of Coleman Hawkins. 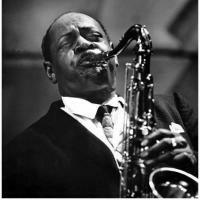 As one of the first renowned jazz tenor saxophonists, Hawkins helped to establish the instrument as essential to the genre, especially for soloists. Hawkins' warm tone and signature vibrato, along with his melodic and technical virtuosity, made him a pivotal influence on future generations of jazz pioneers. Hawkins first broke his name during a gig with Mamie Smith's Jazz Hounds in 1921. He toured with them until 1923, when he moved to New York and joined Fletcher Henderson's Orchestra. During his run with Henderson, he rapidly defined his sound as a prominent soloist, and continued to do so until the early 1930s. In 1934 he traveled to London to play with Jack Hylton’s band and ended up touring Europe as a soloist until 1939. Upon returning to the States, he left his mark on the swing era with his arguably definitive recording of “Body and Soul.” Afterwards, he went on to play with many jazz giants; in the early 1940s he regularly performed live with Miles Davis, Thelonious Monk, Oscar Pettiford, and Max Roach, and in 1944, he led a group with Dizzy Gillespie and Max Roach on what is considered the first bebop recording. After 1948, Hawkins mainly traveled back and forth between Europe and New York, recording with artists like Monk and Roach, as well as Eric Dolphy and John Coltrane. In the late 1950s and early 1960s he resumed a more traditional approach, playing festivals with the likes of Red Allen and Roy Eldridge. Hawkins passed away on May 19, 1969 at the age of 64. Join us at WKCR during our celebration of Hawk’s 111th birthday, as we air 30 hours of soulful swing!